Manual tile cutter with multiple point breaker, allowing for diagonal cuts. Double guide rails for precise scoring visibility. Includes guide for repetitive cuts. Supplied with 6mm scoring wheel. 500 watt tile cutter with large chrome plated table and recessed measuring scale. 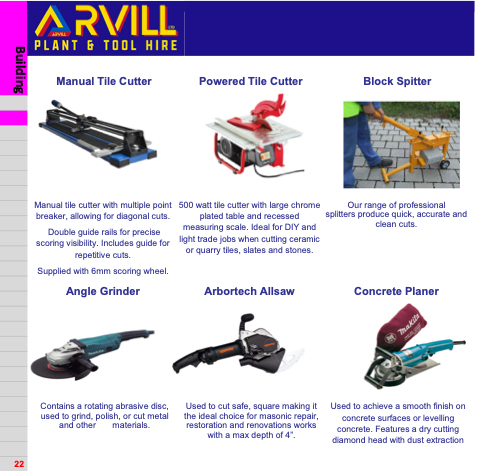 Ideal for DIY and light trade jobs when cutting ceramic or quarry tiles, slates and stones. Our range of professional splitters produce quick, accurate and clean cuts. Contains a rotating abrasive disc, used to grind, polish, or cut metal and other materials. Used to cut safe, square making it the ideal choice for masonic repair, restoration and renovations works with a max depth of 4”.